Christopher Wu, violinist, enjoys a diverse career as an orchestral and chamber musician and teacher. 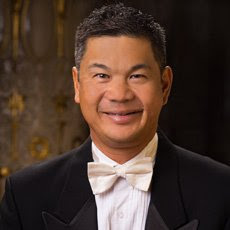 A graduate of the Eastman School of Music, Wu joined the fi rst violin section of the Pittsburgh Symphony Orchestra in 1988, and holds the Nancy & Jeffery Leininger First Violin Chair. In recent seasons, he has performed with the Boston Symphony, Cleveland Orchestra, and the Philadelphia Orchestra. An active chamber musician, Wu has played with a wide range of artists including Nancy Wilson, Joshua Bell, and the Muir String Quartet. Chris has appeared in numerous festivals including Aspen, Brevard, Heidelberg, Savannah, Masterwork, Stockbridge, St. Bart’s Music Festival, and David Kim Orchestral Institute. Mr. Wu is currently an adjunct professor at Carnegie Mellon University. He has taught classes at the University of Texas, Youngstown State University, Ottawa University, Boston University, Tanglewood Institute, West Virginia University, and Penn State. Chris’s violin was made in 1727 by Nicolo Gagliano. In his spare time, he enjoys golf, traveling, and cooking. In 1991, he survived a near-fatal automobile accident, and he is grateful for every opportunity to play.